Nations Press health Look Well at Your Moles,And Know the SIGNS THAT MOLE MAY BE CANCEROUS!-Must Read!! 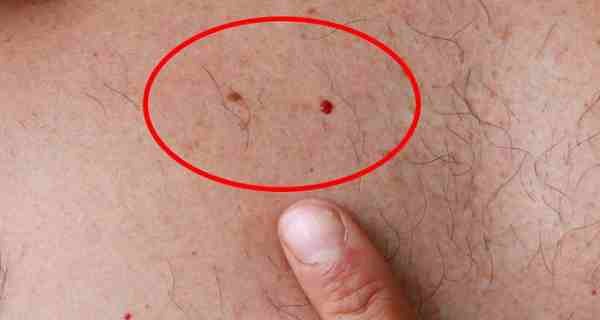 Look Well at Your Moles,And Know the SIGNS THAT MOLE MAY BE CANCEROUS!-Must Read!! SPONSORED LINKS Moles are common skin growths with brown color caused by clusters of pigmented cells. They are usually harmless and appear in almost every human being. However, you should regularly go to your dermatologist and protect your skin from the sun rays. You should not ignore moles on your skin which may be benign now, but you can never know when they become malignant. On the picture above, you can see two moles. One of the moles is a time bomb which can explode at any time. The right reddish mole looks more like a pimple or a zit, but it does not go away. Moles, for instance, should be checked every month for irregularities that might indicate a problem like skin cancer. The first sign of a potentially cancerous mole is a drastic change in color—for instance, moles that are dark, brown, grey, or inconsistent in color (i.e., black in the middle and tan, white, red, or pink) in patches or around the outside should be brought to your doctor’s attention. A mole that has inconsistencies—for example, it transitions in color, shape, height, or surface texture—might be dangerous or unhealthy and should be inspected by a medical professional. Any mole that causes pain or is tender to the touch should be considered dangerous, particularly if the mole exudes fluid or blood. Visit your doctor immediately for a skin exam. Healthy moles don’t grow any larger in size than 6 millimeters (or ¼ inches) in width. If you have a mole that’s large or gradually growing in size, book a medical exam to determine if it’s cancerous. A new mole or a sore that won’t heal no matter how much time, air, cleaning, and ointment you apply may be a potential cancer risk.